This one is an album that is fashionable in mood. A range of singers chosen by Thaman make this album all the more an ace in the race. Megha, Thaman, Sai Sharan, Samira Bharadwaj, Ramya Behara, Rabbit Mac, Nivaz, Deepak, and Simha render songs of different genres. Lyrics are an audio feast. A range of genres and experimentation with words in a song make it a worthy album. In a film titled after the legendary Bruce Lee, a song of this genre was expected. The inspirational undercurrent is of a well-known streak in Telugu film songs. Starring as it does a big star, Thaman makes sure the instrumentation matches the lyrical intensity. The lyrics are easy on ears. Sai Sharan make a stellar effort to infuse the proceedings with his characteristic flavour. If the lyrics are profound, the song itself is foot-tapping. It is a trendy song with the necessary musical innovations thrown in. One senses there is high emphasis on the instrumentation, going by the pop song-like fulcrum. The singers make it a song that is definitely a modish outing. The lyrics sound new and this one is a romantic song with a difference. Thaman shows his verve with his tune that works excellently well when heard in high decibel. Finally, there is an item song for a star. The genre is tailored for the mass audience. Deepak and Ramya Behara are the ones to be trusted for rendering a song like this with aplomb. There comes a point when the beats belong on one side while the lyrics on the other. That is the hybrid streak that has been experimented by Tollywood for some time now. The lyrics are all there to rise the adrenalin level. It's an innovative coining of rhyming words. Bruce Lee and googly is one such coinage. Sameera renders the 'energy-intensive' song with extraordinary ease and gusto. She breathes life into an otherwise run-of-the-mill tuning while Simha matches her sincere efforts. The lyrics are again for both the mass and class audience. Thaman delivers an item song in the regular mould. 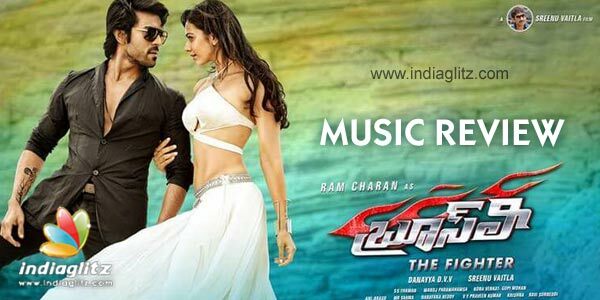 Verdict: Since both Charan and Srinu Vaitla are stars in their respected domains, this one had to be a star album ably elevated by Thaman. This one turns out to be one, catering to all kinds of audiences.